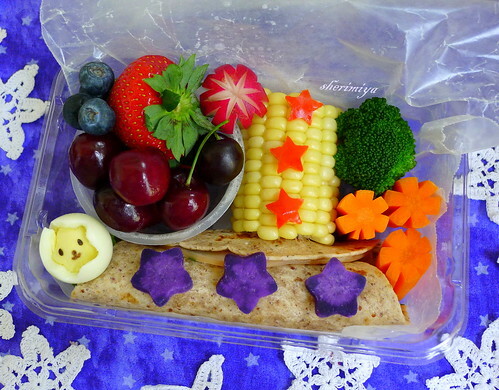 4th of July Field Trip Bento, a photo by sherimiya ♥ on Flickr. I couldn't let this holiday go by without a theme bento, and it's even a field trip bento at that -- so I couldn't use my star or flag picks (or anything nondisposable). So I settled for as many stars as I could fit in this recycled plastic strawberry package. I hope he gets the theme I was going for! There's a turkey spinach cheese rollup in a whole wheat tortilla, a quail egg with a star cutout that cracked (darn! ), some Okinawan sweet potato stars, carrots, broccoli, steamed corn on the cob, red pepper stars, radish, cherries, strawberries and blueberries. I wrapped it all up in wax paper, snapped the box closed, and packed it with a rubber band around it to prevent accidental opening due to excessive swingage. He's going to the Tech Museum for a day of science fun. Then, we've got the 4th off -- yippee! How are you celebrating? Hope you enjoy a wonderful 4th of July/Independence Day! Oooh I want to go to the Tech Museum! I hope he has a great time :) I love all the stars, so much fun! Yeah Heather, you would love the Tech Museum! It's like the museum of the silicon valley, heh. Happy 4th! I really like your radish. It makes me think of fireworks! Thanks Kristie; I hope you made one too: happy 4th! 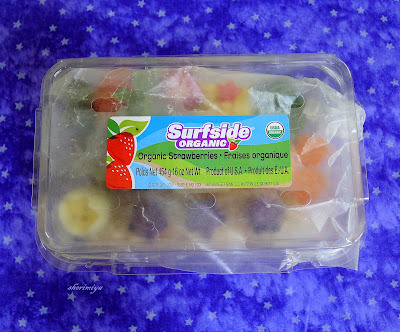 Thanks Shirley; I love the purple potatoes too: so pretty in bento! Love this bento, looks so fresh and cute. I adore all of your bento, even before I decided to try bento for myself, I would always come and read your blog, everything is so inspiring! I'd never thought of using cutters on eggs before. I might give it a go. That's so sweet; thank you obentoadventure!! So glad you're inspired to try. Have fun! aww. yor Bentos looks so yummy!! And I like your gluten free cookies I want to try it! Please tell me what the purple star? Hope you can stop by my blog too and say HI. Thanks a lot for following Sandra! The purple stars are steamed Okinawan sweet potato.